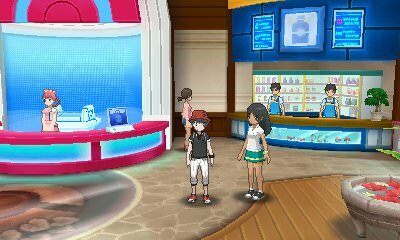 Much like every Pokemon Game since the very first ones ever created, there are a number of characters during your second journey through The Alola Region that will look to trade with you. Unlike your first adventure through Alola, most of these trades are to assist you before each of your Island Trials. Hawlucha - Route 2: Within the Route 2 Pokemon Center, you will find a trainer who is looking to trade their Hawlucha for a Spearow. It will be nicknamed Cha and will come at Level 6; it will also have a Max Attack IV. Hawlucha will be useful for your Island Trial within Verdant Cavern. Noibat - Route 5: Within the Route 5 Pokemon Center, you will find a trainer who is looking to trade their Noibat for a Lillipup. It will be nicknamed Noinoi and will come at Level 19; it will also have a Max Special Attack IV. Noibat will be useful for your Island Trial within Brooklet Hill. Barboach - Royal Avenue: Within Royal Avenue, you will find a trainer who is looking to trade their Barboach for a Tentacool. It will be nicknamed Babo and will come at Level 21; it will also have a Max HP IV. Barboach will be useful for your Island Trial atop Wela Volcano Park. Arbok - Route 8: Within the Route 8 Pokemon Center, you will find a trainer who is looking to trade their Arbok for a Trumbeak. It will be nicknamed Arbo and will come at Level 22; it will also have a Max Defense IV. Arbok will be useful for your Island Trial within Lush Jungle. Phantump/Trevenant - Tapu Village: Within the Tapu Village Pokemon Center, you will find a trainer who is looking to trade their Phantump (who will immediately evolve into Trevenant afterwards) for another Phantump. It will be nicknamed Tumptump and will come at Level 33; it will also have a Max Special Defense IV and be holding Grassium Z. Trevenant will be useful for your Island Trial inside the Abandoned Thrifty MegaMart. Shellos - Seafolk Village: Within Seafolk Village, you will find a trainer who is looking to trade their Shellos for a Granbull. It will be nicknamed Solle and will come at Level 44; it will also have a Max Defense IV and be holding Waterium Z. This is the only way to obtain a West Sea Shellos. Tauros - Poni Gauntlet: Within Poni Gauntlet, you will find a trainer who is looking to trade their Tauros for a Bewear. It will be nicknamed Professor and will come at Level 59; it will also have a Max Speed IV and be holding Normalium Z.